Five months after its Brazil plant opening, Mercedes-Benz has launched SOP of a second model at its new passenger-car plant in Iracemápolis - the GLA. The compact GLA SUV will be flexibly assembled on the same line as the C-Class Sedan. Both models are bestsellers of Mercedes-Benz in the Brazilian premium market. Daimler claims “highly flexible” production is achieved through a low degree of automation in the assembly. 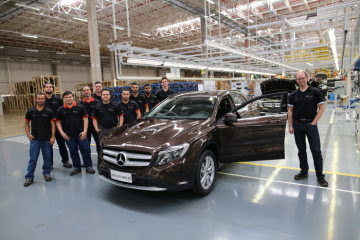 As a qualification measure for the production of the GLA, Brazilian employees were sent to the sister plants in Pune, India, and in Kecskemét, Hungary. On-site, they could get familiar with the production processes in order to pass-on their knowledge to their colleagues in Ircaemápolis as multipliers. The company thereby ensures that all vehicles meet the high quality standards of Mercedes-Benz wherever they are produced. The Iracemápolis plant is located in the São Paulo region and was opened in March 2016. It is part of the global assembly network of Mercedes-Benz. This network also includes the production facilities in India, Indonesia, Malaysia, Thailand and Vietnam. At these locations, Mercedes-Benz produces vehicles in various extension levels for local markets.